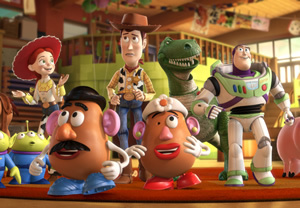 Toy Story 3 bursts with energy, but when all’s said and done, it’s time to box up the toys. Is it worth the extra bucks to see Toy Story 3 in 3D? Not really. The effects are okay, but nothing really pops out. Pun intended. The feature is accompanied by a nifty animated short called Night & Day. It is a clever little piece that does a decent job of taking advantage of 3D, perhaps even better than Toy Story 3 itself. It's kind of harks back to the hay days of DePatie-Freleng, with two bulbous silhouettes silently extolling the virtues of their contrasting lifestyles - day and night. Well, they're silhouettes in that the screen is all black aside from the activity going on inside their clashing forms. The first 10 minutes of Toy Story 3 is so masterfully entertaining, such a piece of pure movie magic, it surges with the sensation of seeing something special that’s rarely been felt since the opening Mayan temple sequence in Raiders of the Lost Ark. A trainload of orphans (played with gusto by a pack of wild-haired trolls) is on a collision course with disaster. The bridge, only seconds down the track, has been loaded up with dynamite and it’s gonna blow. Thank goodness Woody and Jessie and Buzz and Mr. & Mrs. Potato Head have arrived to save the day! Then the unthinkable: The Pig, the most nefarious evil mastermind of all time, dumps a load from his huge pig plane, a big ol’ barrel o’ monkeys. This is apocalypse monkey! A mushroom cloud of little red plastic monkeys engulfs the band of heroes and trolls. It’s a bonanza of creativity and it’s all a story from Andy’s vivid imagination, recorded on home video by Mom. It’s actually kind of a letdown when this adventure in genre-bending make-believe ends and the real story begins. The rest of the movie is also inventive, but the third act gets weighed down by a huge serving of sentimentality. Sure, the first two Toy Story movies loaded up on the sap regarding childhood innocence and imagination, but this one goes for broke in playing up the apparently mandatory and inevitable loss of innocence and imagination as good ol’ Andy heads off to college. C’mon guys, you know toys aren’t just for kids anymore! Even Andy has that inkling, at least at first. A misunderstanding sends Andy’s garbage bag full of toys to a day care center instead of the attic, setting off the beginning of the end. And unfortunately for Woody (Tom Hanks, Catch Me If You Can), Buzz (Tim Allen, Wild Hogs) and the gang, there’s a new boss to contend with: a big, purple, huggable bear named Lotso (Ned Beatty, Superman: The Movie). How bad can he be? After all, he smells like strawberries! Well, as with so many things in life, all’s not quite the way they seem and it’s up to Andy’s collection of toys to break out of the day care center and get back to their proper place: Andy’s attic. As with all of Pixar’s movies so far, Toy Story 3 is loaded with humorous details put into place with a lot of tender-loving care. There’s the jittery elevator of Ken’s Dream House, the creepiness of a baby doll with a broken eye, and that infamous cymbal bashing monkey can be mighty intimidating under the right lighting. Another scene-stealer is Chuckles the Clown, who sits on a window sill while telling his tale of woe and owner separation. At times grimacing madly, more like Chucky than Bozo, Chuckles is the kind of inventive minor character that makes Pixar’s movies so rich and complete. But, following on the heels of Pixar’s spate of ambitious fare during the past 11 years since Toy Story 2 was released, including Wall-E, Ratatouille, and Up, Toy Story 3 in some ways feels like a warmed-over obligation. No doubt it’s an obligation made by Disney’s desire to make one more Toy Story movie, a desire that at one point was going forward without Pixar’s involvement. Banish the thought!